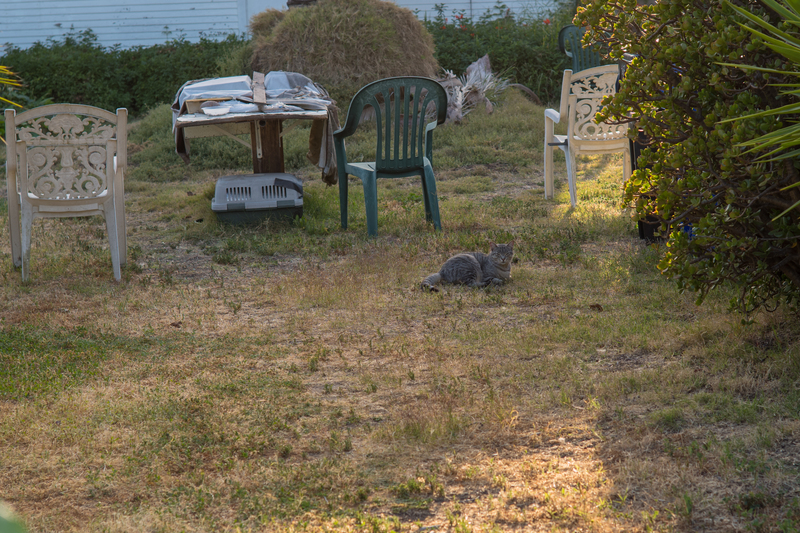 For more than a month, I have stalked what looked like one large feline but turned out to be three in a lush yard near where Florida meets Adams. Finally, you will meet them, as they are presented consecutively. We begin with the one seen first, crossing an alley around April 2, 2018. 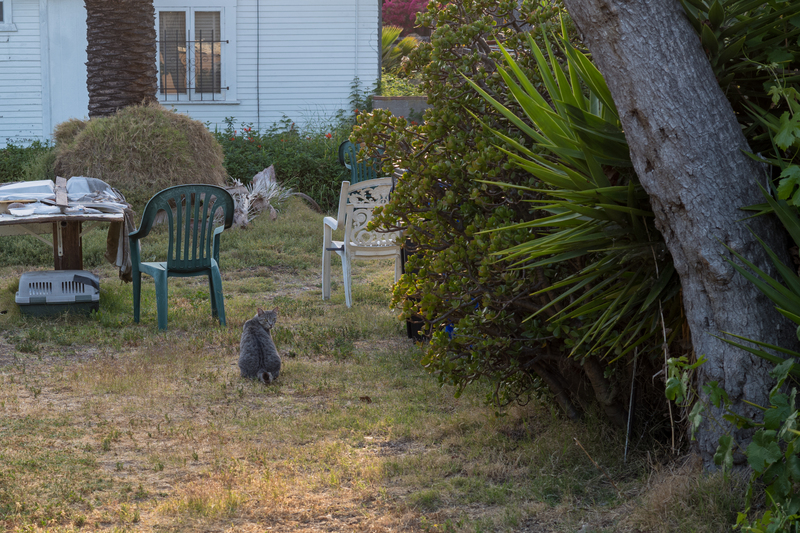 Two days later, I returned to the area, discovered the nearby lovely kitty habitat, and started shooting portraits of his compatriots. The Featured Image and companion were taken on the 28th, using Leica M10 and Summarit-M 1:2.4/50 lens. I nickname the kitty Wily, for avoiding my camera for so long and posing on his (or her) terms. Vitals for the first photo: f/8 or f/11, ISO 100, 1/90 sec, 50mm; 6:25 p.m. PDT. The second: f/5.6 or f/8, ISO 100, 1/180 sec, 50mm; 6:31 p.m.
From the archives: Scruffy, Roly Poly, Woo, Skull, Biscuit, The Colonel, White, Chipper, Frisky, Stretch, Needy, Farfisa, Mates, Hunter, Pee-Pee, Blue, Blue Too, Bonded Pair, Patience, Fess, Jumper, Frenemy, Looker, Cozy, Scout, Lurks, Skit, Mini, Betty, Black and White, Stalker, Bell, Chill, Sammy, Scratch, Poser, Star, Grey and White, Watcher, Herman, Comet, Roman, Willow, Chub, Nimbus, Watson, Lilo, Kit, Pepe, Twilight, Sebastian, Spot, Booger, Ash, Veruca, Riley, Mellow, Bonde, Flower, Glass, Black, BeBe, Fang, Bruce, Siamese, Pounce, Tortie, Haiku, Fraidy, Peso, Daniel Tiger, Dusk, Stride, Dainty, Spry,Tabby, Betty Too, Still, Levi, Shadow, Sophie, Wink, Ferals, Momma, Charlie, Tux, Cool, Benny, Jellicle, Itchy Valentino, Goldie, Nine, Amanda, Siesta, ChaCho, Charlie, Too, Mika, Crystal, Seeker, Mittens, Dancer, Smokey, Monkey, Captain Blackbeard, Season, Maven, Tink, Chunk, Curious, Hanoi, Bella, Tarry, Guido, Maxine, Mr. Kitty, Peohe, Panda, Frankie, Sunshine, Twain, Willow, Too, Brawn, Reddy, Burglar, Laramie, Lupe, Bright, Tom, Charm, Buddies, Boss, Ohana, Seer, Fresh, Token, Lola, Carl, Bramble, Finny, Cal, Tipsy, Zander, Mew, Penny, Charlie (the Third), Bob, Apple, Persepolis, Sebastian, Too, Holiday, Snow, Desire, Luci, Torbie, E.T., Bushy, Cali, Precious, Gracie, STAR, Sky, Amble, Aylin, Lucky, Herbie, The Love Bug, Roadie, Harley, Wonder, Dizzy, Moophie, Lucy, Choontzy, Abby, Kitty, and Stella.